The rain came to an end and this year it has been really wet. Hopefully all the rain will help to have more food and more water sources for the dry winter season. The future will tell us. All the rain brings us a clement climate, high temperatures are finished and we now welcome to the cool down! It is time for colourful flowers and bushes and of course the re-new. After observing the remarkable and often comical display rituals of the myriad of bird species on the reserve, it is a pleasure to see the fruits of their efforts, as juvenile birds are fledging and can be seen foraging under the close watch of parents and family. Most interesting is to watch the victims of brood parasitism species feed their often larger, murderous and unknowingly adopted chicks. At the beginning of April Monotonous Larks (Mirafra passerina) started their incessant calls, which is a sign of the coming dry season. Another major happening this month is the discovery of a new leopard (Panthera pardus) cub! At about 3 to 4 months old, this little cat made everyone’s heart sing. After a few attempts to find the Kopje of Eden where Mum and baby were reported to be, we finally spotted the stunning mother, well-camouflaged and resting peacefully. Suddenly, to the group’s total amazement, a dark, fluffy, miniature version appeared from behind the rocks, joined its mother and gave us a magnificent spectacle by feeding on small kills in front of the red sunset. We cannot wait to watch as this adored young leopard grows! The mammals started slowly returning to the permanent water sources of the Reserve. African elephant (Loxodonta Africana), plain zebra (Equus quagga), impala (Aepyceros melampus) and greater kudu (Tragelaphus strepsiceros) have come back to drink to the delight of all the volunteers. Thanks to our hard workers volunteers we have made good progress in several of our projects. This project aims to take down a huge, unused fence on a neighbouring property and, at a later stage, possibly use the material to build a boma, which is a fenced area that helps to confine animals for a period of time prior to re-introduction on the Reserve. There is a possibility that we will take on a pack of wild dogs who need to split from the existing Reserve which is fenced and thus will not be able to accommodate the growing pack. Wild dogs are the most endangered carnivores in Africa so you can imagine how exciting it is to work towards their introduction here at Wild at Tuli! They will need to acclimatise to their new surroundings in the boma first before being totally set free. The fence we are removing is 30 wires high and covers an area of 2,500 hectares. This fenced area was formerly used to breed exotic antelopes such as Sable and Roan Antelopes, but this activity stopped since the reserve was bought by a new owner. Volunteers have learnt fast and turned into fence removing experts. Volunteer’s team up in pairs, one unclipping a strand of wire from the metal poles while the other rolls the wire until it gets too heavy to carry. Only then do we cut the wire so that long lengths are available to use in the future. We have successfully rolled over 8 km of wire so far! A new road appeared in the landscape around Motswiri! Volunteers worked hard under the African sun to clear a short but rocky road in only 2 days. The new road, nicknamed “Sunset Boulevard”, starts near the famous Mushroom Rock and leads to a kopje further away into the bush. 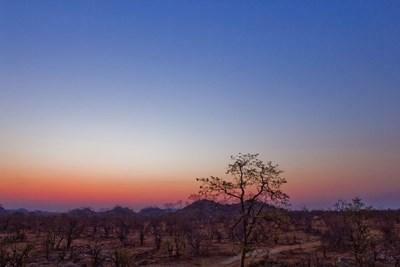 This kopje has a flat centre with rocks surrounding it, giving a wonderful view over the area and onto the ever-stunning sunset. Alistair Wilmot led the clearing of the new road with lots of machete work to cut trees and clear the sides of the road. Many rocks needed to be removed and some were so big that special jacking and towing was required to get them out of the way. However, our hard work soon paid off. As soon as the road was completed and before the hardworking volunteers left camp, we all enjoyed a magical sleep-out on “Sunset Kopje”! After a nice dinner on our pride rock, everyone slept on the ground with volunteers taking turns to keep watch for any unexpected visitors. As the rains came to an end and after they eroded the roads and created dongas (aka. holes), it was time to start the much needed job of “Road Repair”. As it is also rather uncomfortable to drive on rollercoaster roads and jump out of your seat on countless occasions, it was a relief to start the work! 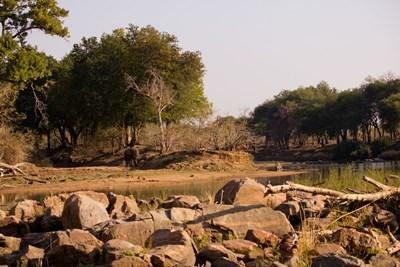 Our focus this month was the repair of the main road from Motswiri Camp to the dirt road that cuts our reserve in two. Volunteers used picks to dig holes in the road and spades and wheelbarrows to get hard sand to fill the dongas. When necessary, a dam of rocks was built on the sides of the road to prevent water from accumulating at that spot again. Volunteers were so dedicated in the task that they even added sand in the original color to the repaired section as a finishing touch “so it looks beautiful too”. The main bumpy areas of the road have been repaired this month and we will continue efforts over the next months for smoother and even more enjoyable drives! A neighbour asked us to help him to protect one of his millennium baobab (Adansonia digitata) against utilization by elephants. Elephant of the area are often caught using the spongy, fibrous tree as substitute of water. Effectively the tree is really rich in moisture. Several techniques have been used to protect the baobab against the use of elephants; these techniques include using wire, wood, and pointy rocks. This time we decided to try a new methodology: sharp, pointed and moving rocks. Elephant like to walk in flat and sure area; they feel uncomfortable when the ground is not stable. The work was hard and efficient; the tree has been completely secure by rocks, a ring of 3 meters wide. We set a camera trap to see how the elephants react to this protection and will be able to better judge which is the best method. 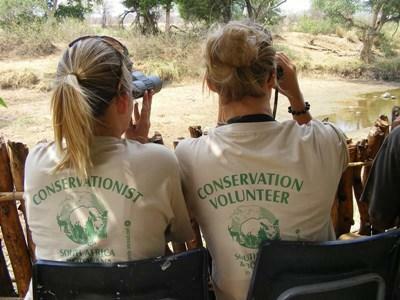 River bird census is a survey of bird population, migration and density next to the Limpopo River. Species change through the year, depending on the season but also the water level. We are using a fix point method, during 45 minutes we write down all the species we hear and see. The river bird census has been great the last two months with 43 species recorded. Some summer visitors like Broad-billed roller (Eurystomusglaucurus) Woodland Kingfisher (Halcyon senegalensis), or rare species for our area like brown-hooded kingfisher (Halyconalbiventris), Green-backed Camaroptera (Camaroptera brachyuran), Long-Billed Crombec (Sylviettarufescens) and Tropical Boubou (Laniariusaethiopicus) have been spotted. Volunteers have spent time collecting seeds on the Reserve with the aim of developing a tree nursery. They have planted 7 tree species so far and we hope they will all germinate. This will become an on-going project to develop a full nursery of indigenous plants which we will eventually plant out on the Reserve. Our camera traps yielded some interesting pictures including Ground Hornbill, Baboon, Waterbuck, Bush Pig, Leopard and Klip Springer. We are delighted to report that we have not lost any more cameras to the ‘villians’ of the Reserve in the last 2 months. These last 2 months we experienced severe flooding of the Limpopo river with water levels rising many metres and flooding whole camps on Reserves near us. The water levels were so high that we could not drive on the River roads for quite some time and had to put a lot of effort into repairing what was washed away. Volunteers helped in a real emergency during this time when the Commercial Camp on the Reserve was threatened with being washed away – they all got stuck in and helped evacuate the entire camp, from furniture to appliances to the tents themselves. We could not have done it alone as we had a very limited time to carry everything across the hanging bridge which gives access to the camp, while the water was rising! It is a sad reality that many people are very careless in how they discard their rubbish and over time the road between the Reserve and the Botswana border become littered. It has become a favourite of the volunteers to go out on a weekly basis and clear all the litter on the road. Besides being unsightly, glass bottles and rusty tins pose a threat to animals who may walk on them and get injured or even for small species be stocked inside and die.